This is big news folks! The Pentagon has found $12.8 billion they could use to build President Trump’s wall. The Department of Defense has provided a list of $12.8 billion worth of projects from which President Donald Trump could divert funding in order to pay for a wall on the United States’ southern border. Democrats pushed for the list to be released in hopes of rallying members of Congress to vote to override the president’s veto of legislation blocking his national emergency declaration — but their strategy could backfire. 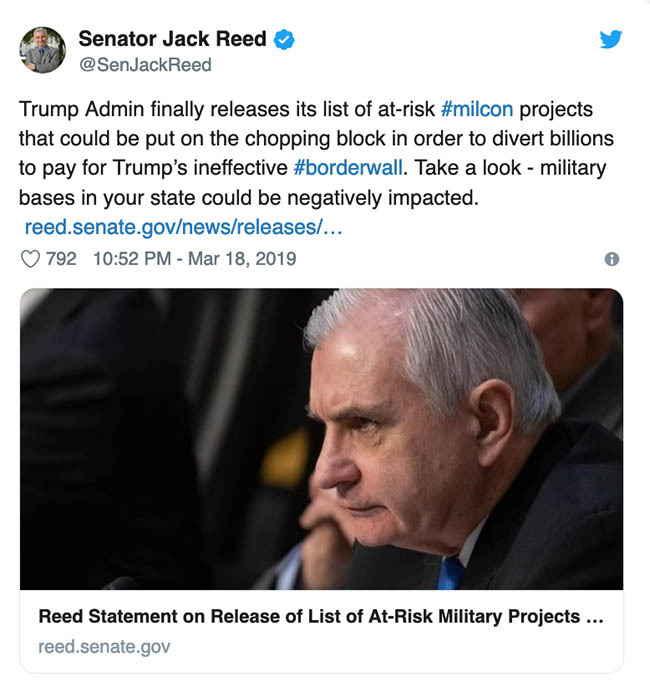 During a Senate Armed Services Committee hearing last week, Sen. Jack Reed (D-R.I.), the ranking member on the committee, pressed acting Defense Secretary Patrick Shanahan to provide a list of projects that could be sacrificed in order to pay for a border wall under President Trump’s declared national emergency.